Steam Machines are coming in 2014, and applications for a very limited beta are now being taken. Monday's announcement of SteamOS was big news, but what's an OS without something to run it on? Thus, Steam Machines - plural, as you may note, because as today's announcement states, "Entertainment is not a one-size-fits-all world." Valve intends to partner with multiple manufacturers to build a variety of systems of various capabilities. No numbers have been revealed but the company said "there will ultimately be several boxes to choose from, with an array of specifications, price and performance." In the meantime, it's cooked up a "high-performance prototype that's optimized for gaming, for the living room, and for Steam," and this is where things get interesting: 300 of these rigs are being built and offered to beta testers, free of charge. Signing up for the beta is a pretty simple process but the quickie version is that you'll need to join the Steam Universe community group, agree to the T&C and play a game using a gamepad in Big Picture mode. Once you've completed all the required steps, you'll be awarded a badge and added to the pool of potentials - but you've only got until October 25 to put your name in the hat. 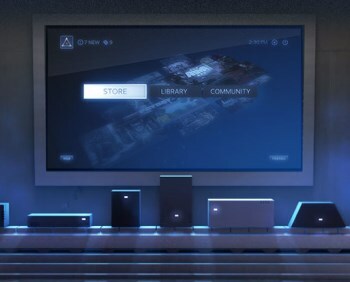 The Steam Machines can be "hacked," and while they will presumably ship with SteamOS, will also be able to run other operating systems. The hardware can be changed, users will also be able to install their own software and it will support a mouse and keyboard, although Valve seems more focused on the idea of doing everything with a gamepad. In fact, the final sentence of the announcement offers a possible hint about the big reveal coming on Friday: "Stay tuned, though - we have some more to say very soon on the topic of input." "The topic of input" doesn't sound much like Half-Life 3, but fingers crossed anyway.